Access Not Denied! : Starbucks, Do You Want Cream With Those Returns? Starbucks, Do You Want Cream With Those Returns? Today I would like to write about a company that sells not only a product that is addicting, but also a retail experience that may just be as addicting. The company I will be writing about is none other than Starbucks. Starbucks (SBUX) is the largest coffee roaster in the world, the Starbucks corporation operates over 6700 company-operated stores and licenses over 4000 stores in the United States; they also operate or license over 6000 in other countries that include Canada, the U.K., China, Germany, and Thailand. The company was founded in 1971 and has close to 150,000 employees, its Chairman, President and Chief Executive Officer is Howard Schultz. As an investor I try to find companies in which I believe have unique moats or at the least strict barriers to entry. Does Starbucks (SBUX) have this? I believe that it does. In my opinion, opening up a retail coffee shop and competing with Starbucks would probably be a bad idea, yes there are other establishments like Dunkin Donuts that is operated by Dunkin’ Brands Group (DNKN) or McDonald’s (MCD), but one can argue that they serve to a different clientele. Obvious these establishments can fund new stores, but I do not believe that they care to aggressively compete with Starbucks. This leaves the small mom and pop coffee shops to compete with them and these shops certainly have more problems to worry about than competing with Starbucks. I personally think that Starbucks does a great job keeping its customers happy by doing things such as offering free WIFI to its patrons and creating a real cafe feel to its stores. When I go to one of their stores I see many people on their laptops or engaged in conversations with friends, I truly sometimes feel that one of these people may be an aspiring writer or future entrepreneur. I think that this experience is hard to find and is precisely the moat that Starbucks commands. 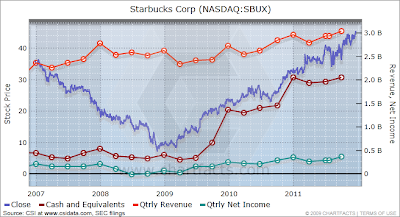 As you can see from the chart above (courtesy of ChartFacts), Starbucks has traded well since the historical market bottom in 2009, the company was still producing impressive revenues during this period, yet got caught being mispriced just like many other quality companies. Below I have included a chart from our friends at Barchart showing a comparison of SBUX to the S&P for the last five years including dividends reinvested. As we can see Starbucks completely destroys the S&P in returns. 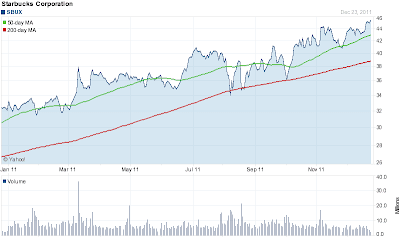 Starbucks has also has been technically trading well this year during a pretty flat overall market. 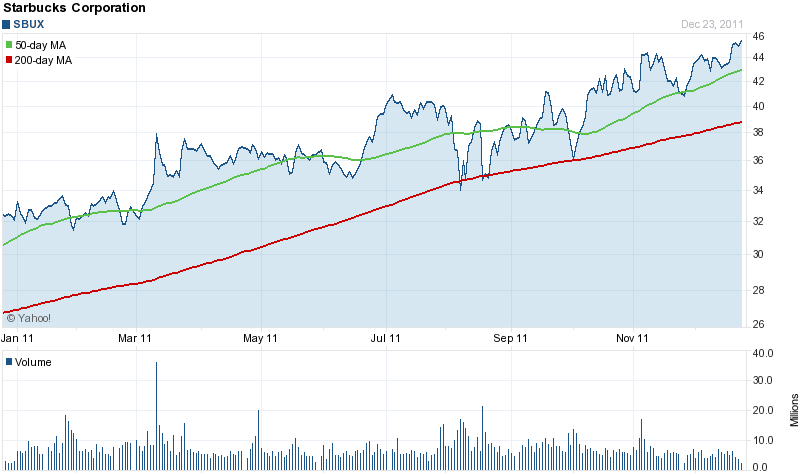 The stock has been consistently trading above its 200-day moving average as we can see from the chart (courtesy of Yahoo! Finance) below. In conclusion, I would like to say that I think one should consider Starbucks as a great addition to their portfolio. The company pays a dividend and is still in its growth phase. 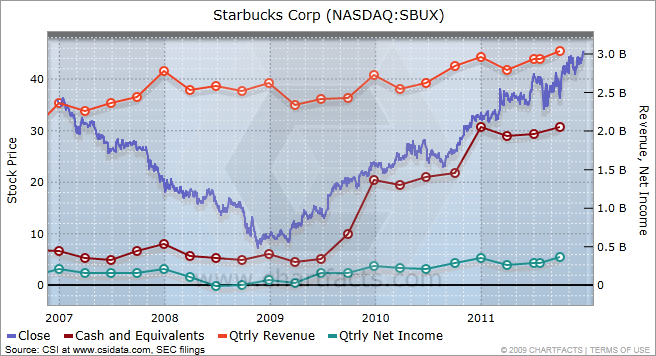 I have personally owned Starbucks for many years and do not envision selling shares anytime soon. Do you think its time for your caffeine fix?